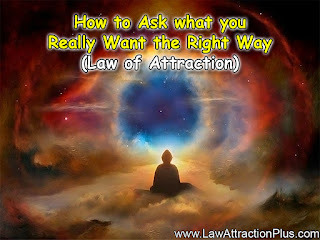 How to Ask what you Really Want the Right Way (Law of Attraction) | Law of Attraction Plus: The Secret revealed! The first step in the creative process is to ask for what we want, but unfortunately we have never been taught to ask, much less to receive. When I tell people to play that: "I am the genie of the lamp and I will give you a wish, but I will only give you 30 seconds to ask me what you want. If the time is over and if you have not asked anything, you lose your chance". I want to be happy, I want global poverty to end, I want to be prosperous, I want to feel good, I want a lot of love, I want success and requests like that. That is in the best of cases, because some people answer with this type of requests: I do not want to be poor, I do not want to be sick anymore, I want my partner to change to be happy... etc. With this kind of general and undefind requests, what do you expect the Universe to give you? It has to be specific, positive, quantifiable, it has to be in present tense, it has to include an emotion, it has to be ecological for those around you. And then, let the Universe give you the best for you at the right time. "I am very excited because my 2016 yellow Camaro is great, I love its color, its chrome steel hubcaps, I love its sunroof, its leather seats have a new aroma that fills me with enthusiasm. When I drive it, I fell its soft steering wheel and the engine sounds awesome. It has come to me under grace, in a perfect way and for the good of all involved. Thank you for this or something better." If you pay attention, this declaration is in the present tense because it describes you at the time you are already experiencing it; it is specific because it gives details such as branding, color, seats; it carries an emotion of gratitude; it is quantifiable by simply specifying the details and you always should finish with the phrase: "for the good of all involved, thanks for this or something better". Now the Universe already knows to give you what you really want, and it will start to organize the synchronicities so that you can get what you have selected from the cosmic catalog. Now the next step is to be receptive to the signals that will come to show you how to become it material. I am your friend Arturo Rivera, thank you for belonging to my Universe and thank you for allowing me to enter yours!